As the best company in residential home driveway sealcoating, paving & repair, our expertise has successfully served homeowners in Westchester County, NY and Fairfield County, CT, supporting communities such as White Plains, Armonk, Stamford and Greenwich since 1979. 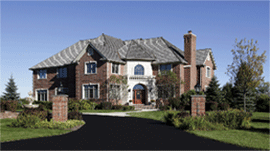 At Castle Driveway, we provide a 100% workmanship guarantee and are fully-licensed and insured. That’s why we’ve been the trusted source for asphalt driveway paving for over 35 years. 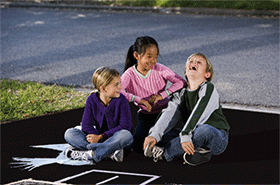 Our goal is to beautify and preserve your asphalt property investment, while ensuring a safe environment for your children and pets. A scheduled program of pavement maintenance beautifies and protects asphalt pavement for a fraction of the cost of overlaying with new asphalt. Left untreated asphalt will deteriorate due to moisture, cracks, ongoing wear and tear, engine oil spills, anti-freeze and even oxidation. A proper maintenance program that includes periodic sealcoating and crack filling will more than double the life our your asphalt pavement. Sealcoating is a protective barrier placed over the asphalt that locks out harmful agents such as gasoline, oils, ultraviolet rays and water. Periodic maintenance of your driveway will drastically slow down its deterioration and extend its life. Long term, this will significantly reduce the cost of maintenance and enhance the look and value of your home. Sealcoating is recommended for new pavement within the first 12 months, and should be re-applied every 2 -3 years to restore and maintain a “like new” appearance. 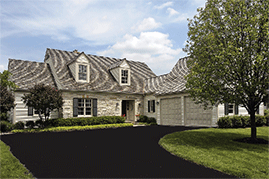 Castle Driveway’s proprietary seal coating is superior (and exclusive) to customers in our market area. Our beautiful, high quality – long lasting sealer protects the pavement better than any competitor. As a result our customers have lower maintenance costs, which greatly enhances property values. The “freeze and thaw’ fluctuations of the weather in our area can cause dangerous and unsightly cracks in your driveway. Producing large cracks and holes, this condition allows for the collection of dirt, weeds, standing water (a recipes for dangerous mosquitos) and other problems. Ideal for year round repairs of divots left from dumpsters; potholes; improper seams and sunken utility cuts; etc., infrared heat softens asphalt pavement without burning off integral tar oils (which provide asphalt with flexibility). After a few minutes of heating, asphalt in the repair area can be raked and rolled back into place and additional hot mix can be added when needed resulting in a seamless, contiguous repair. 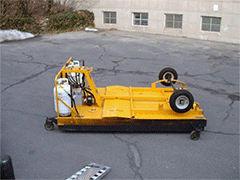 Asphalt patches are saw-cut and the damaged material is removed. After the base is repaired with new base aggregate and compacted, the sides receive a tack coat. Then, new plant mix asphalt is added and compacted with a vibratory roller. A hot joint rubber sealant is added to the saw cuts and smoothed to the surface to make a watertight seal. We offer different forms of patching that will fit any customers’ need and budget, such as cut outs, skim patching and infrared patching. We can do all sizes of asphalt patching and repairs, large and small. The benefit of Castle Driveway’s Scheduled Maintenance Program is that we will help you save money on preventable, costly repairs as well as increase your homes’ curb appeal. As owner, I personally oversee every job, regardless of crew size, and fully guarantee our workmanship. Please contact me with any questions and to schedule your job.